Happy Thanksgiving! And it's that time of the year where we look for the best deals, promos, and discounts. 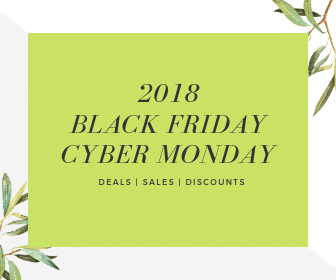 So here's our master list of the best CBD Black Friday and Cyber Monday sales and deals for 2018! Other brands have yet to announce their promos so we will definitely update this as we get more news. And if you don't see your favorite brand here or can't wait until Black Friday or Cyber Monday, you can always check our Deals page with ready-to-use codes for discounts! Best Sellers: CBD Tinctures that come in six flavors and in 250mg/500mg/1000mg, CBD Gummies, and the Essentials by Savage CBD line that combines terpenes with essential oils and come in tinctures and vape cartridges. Best Sellers: Their gummies especially the sour bears and their 100% natural flavor CBD oil that ranges from 250mg to 4500mg! See our review of MedixCBD here. Best Sellers: Their Chill Gummies, Relaxation CBD Shots, CBD Vape Additive, CBD Cream under their Biotech Line, and CBD Infused Cake Pops. See our review of Diamond CBD here. Best Sellers: NuLeaf only carries Full Spectrum CBD Oil and come in 240mg/725mg/1450mg/2425mg/4850mg and a 240mg for pets. See our review of NuLeaf here. Best Sellers: No doubt, it's their Full Spectrum Hemp Oil with a subtle orange flavor that everyone is raving about! Including their Hemp Rub. See our review of Populum here. Best Sellers: Their CBD gummies which they call CBD Chews and their CBD Topical are fan faves. Best Sellers: The uniquely flavored Cinnamint CBD Tincture along with other CBD tinctures, and CBD Capsules. Best Sellers: CBD Shots , CBD E-liquid, and CBD Gummies. See our review of Hemp Bombs here. Best Sellers: Their CBD oils that come in 4 flavors (natural, spearmint, orange, and lemon-lime) and their vape devices and cartridges. See our review of Koi CBD here. John's CBD is a CBD marketplace that resells other CBD brands.